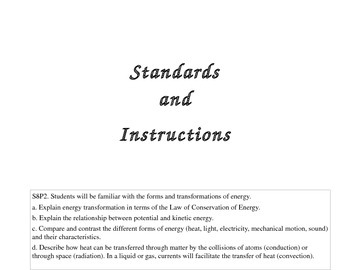 Using Energy flashcards students will compare and contrast the different forms of energy (heat, light, electricity, mechanical, motion, sound) and their characteristics. The 34 flashcards can be used for review. Students can work in groups of four to make the game more interactive and effective. Each group can select a leader who keeps up with the flashcards and scores. Students will take turn to define the words and they can also sort the nine forms of energy given into two categories, kinetic and potential energy. 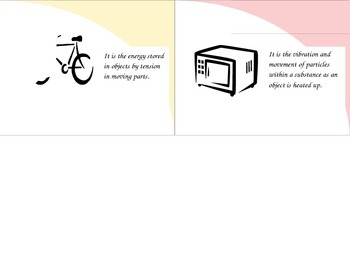 Students can also try sorting energy resource into two categories, renewable and non-renewable energy resource. The activity is aligned with the standard: S8P2a,b,c,d. S8P2. 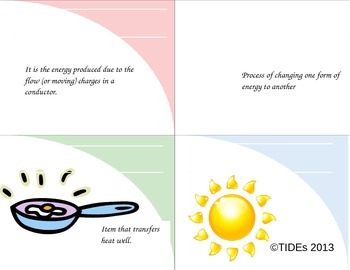 Students will be familiar with the forms and transformations of energy. b. Explain the relationship between potential and kinetic energy. d. Describe how heat can be transferred through matter by the collisions of atoms (conduction) or through space (radiation). In a liquid or gas, currents will facilitate the transfer of heat (convection). 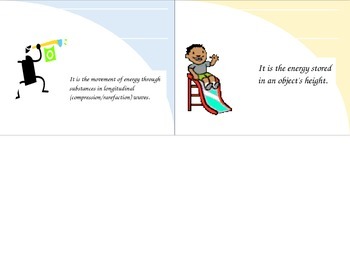 Energy flashcards by TIDEs is licensed under a Creative Commons Attribution-NonCommercial-ShareAlike 3.0 Unported License.